An Ace Metrix survey analyzes the right time for brands to use the strategy. Animation has been part of advertising since the advent of motion pictures. From Maypo in the 1950s to Geico and Red Bull today, mascots and other animated elements populate some of the most memorable brand campaigns. But just how effective are they? And when should brands use them? A study from analytics firm Ace Metrix surveyed responses to 14 campaigns featuring animation to find out. The results were overall positive, said CEO Peter Daboll. "Agencies can use animation to extend some creative boundaries, but we also found that using animation can also make more challenging brands more appealing and their message more accepted than a spot that used traditional actors," he said. Ace Metrix undertook the study after reading that long-form animated ads are on the rise despite the popularity of short-form video content. Because the firm tests every new ad airing in the U.S. and tags them for categorizing, the data on responses to animated or partially animated spots was already available for them to study. Their findings revealed that, when used appropriately, animation can be helpful to brands, particularly those that need to deliver dry content. Long-form education ads had some of the study’s strongest Top 2 Box purchase intent scores, meaning that consumers stated their interest in a product was "very likely" or "fairly likely" after viewing the ad. Hello Toothpaste’s An Inconvenient Tooth scored high among viewers, who weren’t bored by more than a minute of an anthropomorphic tooth teaching them about chemicals. It also worked well for Taco Bell, whose National Taco Day narrative short spun up a whimsical origin story to promote the brand’s giveaway day. Brands whose products require uncomfortable conversations can also benefit from animation, said Daboll. "The use of humor and animated characters can keep viewer interest and attention where they may not in a typical format," he said, although results are not always immediate. 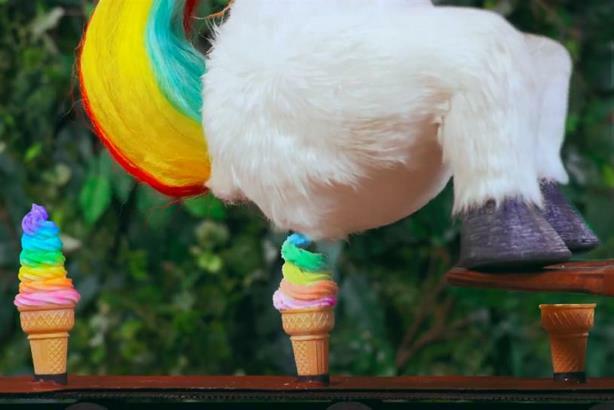 When Squatty Potty released a partially animated spot in 2015 starring a CGI unicorn pooping ice cream, the Ace Metrix survey at the time returned a high disfavorable rating. While a handful of consumers found the spot hilarious, many more were turned off by either the product or the weirdness of the presentation. But a year later, the unicorn reappeared in a second spot and the results improved. "As viewers are exposed to the animated ads for uncomfortable ailments, polarity drops," said Daboll, "meaning they become more comfortable with the product and message." Offbeat animations can be just as polarizing as difficult products, and unlike the latter category, viewers are unlikely to become more comfortable with the imagery over time. Mountain Dew’s surreal PuppyMonkeyBaby Super Bowl commercial, which launched an energy drink, disturbed many viewers with its strange mascot, a CGI mashup of a puppy, a monkey, and a human baby. But, as Daboll pointed out, "shock and creepy characters enhance the message to their core brand target" — men between 18 and 35. Buying primarily in digital might be a good idea for such campaigns, Daboll added, since that audience lives online. Regardless of the product or campaign, though, animation should be used just as thoughtfully and strategically as any other campaign element. After all, it’s just another strategy; it can’t fix a bad concept. As always, story is key. "Brands and agencies need to choose the best way to tell their story," said Daboll, "and if a unicorn or a talking dog delivers the message more successfully, then they should go with it."